King of the BBQ (UK ONLY)GG30Especially for the BBQ-loving man in your life. 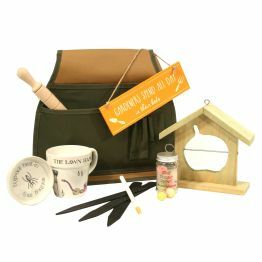 Beautifully packaged in a sturdy box which has been sealed with manly gaffer tape and a special label, The King of the BBQ Gift Box contains a number of really useful BBQ Gifts that he'll enjoy putting to use next time he feels like setting fire to something! 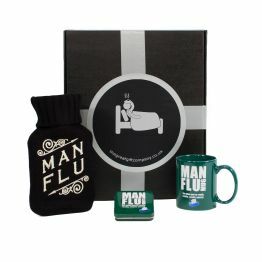 Especially for the BBQ-loving man in your life. 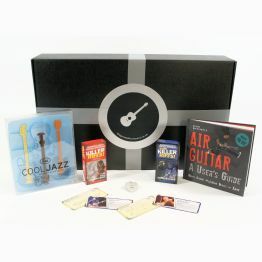 Beautifully packaged in a sturdy box which has been sealed with manly gaffer tape and a special label, The King of the BBQ Gift Box contains a number of really useful BBQ Gifts that he'll enjoy putting to use next time he feels like setting fire to something! A Man Apron - perfect for the self-proclaimed King of the BBQ, the Man Apron has pockets for all his BBQ essentials - matches, beer, phone, mustard, ketchup and tools. 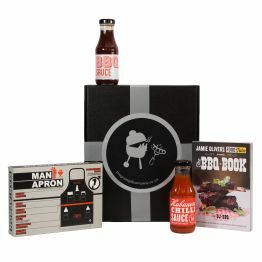 Made from flame-retardent material - The BBQ Book from Jamie Oliver's Food Tube featuring 50 mouth-wateringly wonderful BBQ recipes - And finally two jars of really scrumptious BBQ Sauce and Habanero Chilli Sauce - as if more fire was needed!